Cattleya orchids are best known for gift-giving purposes. Add a few these to similar sized and shaped flowers to arrange a marvelous arrangement out of these. As pretty as they may seem, having them to re-bloom could be quite a tough job. It takes a good 2-3 years before this orchid demands repotting. There are indications that may aid you in knowing the right time to re-pot cattleyas: when the mixture becomes sour, it has formed mold over the surface or the plant is outgrowing from its pot. If all or any one of these conditions are depicted, you know that it should be repot. A coarse medium would do just fine for it. 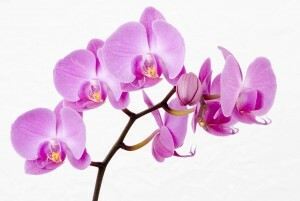 Feed your orchid with high-nitrogen fertilizers once a month. When the last flower of your orchid has dropped, it is now time to prepare it for a re-bloom. The flower spike should be cut with great care. The cut should be made down to the stem with a sharp tool. The open cut could be sealed with a melted candle. All you have to do now is to take care of it by providing it with ideal lighting and other important conditions. Your cattleya would re-bloom sooner than you know of it! Dendrobiums are much like, and are sometimes even called, the phalaenopsis orchids. These are ideally used as cut flowers to give away as gifts. The reason being they come in great many colors and are long-lasting because of their tough stems. Dendrobium orchids require repotting once every two years which should take place right after it’s blooming, in the spring season. A mix of orchid mix and fir-barks would do a fine job for this orchid’s new pot. Continue with the rest of the lighting, watering and temperature conditions as it was before it bloomed once and a possible re-bloom is expected. Use a high-nitrogen fertilizer and feed your dendrobium once a month. The quantity should be 1 tea-spoon per gallon of water that you use for watering. A change of fertilizer from high-nitrogen to phosphorus-rich fertilizer could promise a better re-bloom. These are the most commonly bought and sold orchids as they are easiest to take care of. These flowers are quite long-lasting and bloom for a longer period of time than any other member of the orchid family. The repotting takes place every year for this orchid. Same size of pot could be used for a new pot as phalaenopsis grows upwards. Water shouldn’t be over-done right after repotting. Use in meager amount and wait for the new roots to grow and set up a base underneath. The dead flower spike should be cut halfway down through the stem right after the last flower drops. Take care of this orchid with the same conditions prior to the first bloom and it will make you proud by re-blooming soon! With just a little care and effort, your orchid will be blooming again within no time. All you have to do is take care of the basics, as you were doing so before the blooming, and your orchid will be one happy flower! The right temperature, waterings, lighting conditions, feeding quantity and their estimate repotting time should become a part of your memory at all times. Note down the dates on a calendar. It will be easier that way to keep a check on it. Happy re-blooming! ← How long do Orchids Live Growing Indoors?